In my article The World Is Not Waiting For Trump (January 30, 2017) I predicted that the inward looking, ‘my-job-is-not-to-represent-the-world’ Donald Trump will not make America great again, but will hasten the passing of the superpower relay baton from the U.S. to other nations eager to fill the vacuum left behind. This thursday Mr. Trump announced that he was pulling the U.S. out of the Paris Agreement on Climate. One thing is certain, you cannot accuse him of reneging on his campaign pledges. This is the same person who in November, 2012 tweeted: “The concept of global warming was created by and for the Chinese in order to make U.S. manufacturing non-competitive.” And talking about the Chinese, picking up the slack after the U.S.’ departure from Paris is China that promised to work with other countries to achieve the objectives of the Climate Agreement. In 2005 the U.S. with Japan, Australia and (later) India and South Korea – all of them very suspicious of China’s increased assertiveness on the world stage – started the so-called Trans-Pacific Partnership (TPP), a trade agreement to compete with China-led Regional Comprehensive Economic Partnership (RCEP) a proposed free trade agreement that will account for 3.4 billion people (about 47% of the total world population) and a combined gross production of USD 21.4 trillion (about 30% of the world’s GDP). Skillfully the Obama Administration kept the RCEP playing second fiddle to the TPP. That is until Mr. Trump pulled the U.S. out of the TPP. Under China’s leadership and without any U.S. participation, the RCEP is bound to now become the quintessential free trade agreement of the 21st century, a title previously held by the TPP. Mr. Trump’s action has also revived the interest in a China-led Free Trade Area for the Asia-Pacific (FTAAP) which includes Russia. As a third pole, China’s One Belt One Road initiative consisting of a maze of road, rail and port projects to connect Southeast Asia, Africa and Europe is picking up momentum. China is on track to reviving an ancient network of land and ocean silk trade routes of centuries past. And China found an unlikely partner to make it great again: the President of the United States. Next week the Shangri-La Dialogue on Asia’s new strategic order will be held in Singapore. Traditionally these annual talks promote policies to strengthen US regional leadership. The signs so far suggest that Mr. Trump has no policy and most importantly no appetite to contest China’s growing global power. Awe riba Dia Anti Tabako, laga nos realisá kuantu daño tabako i nikotina ta kousa nos prohimó, sernan kerí i nos mes. Tabako ta mata 7 mion hende na mundu tur aña i si nos no hasi algu, e sifra aki lo sigi subi. Tras di e sifranan aki tin hopi sufrimentu, tristesa den kasnan di famia, apsentensmo na trabou i gastunan haltu den e sektor di kuido. Nos mester subi akseins riba produktonan di tabako, mester bin regla kon ta merkadiá e produktonan aki, prinsipalmente pa loke ta trata nos hóbennan, i mester bin pa lei, atvertensia di e peliger di huma riba empake di produktonan di tabako. Mi ta orguyoso di a subi akseins riba sigaria komo Sekretario di Estado i a pusha e lei pa prohibí humamentu den lugánan ku un dak komo Parlamentario. E lucha no a kaba. E frontera nobo ta e sigaria elektróniko ku no ta reglamentá i ku keta bai ta venená nos ku nikotina. Pronto lo mi presentá un proposishon pa kon atendé ku e fenómeno di sigaria elektróniko. KARNI KU A PASA FECHA? E PROBLEMA MAS GRANDI I KOMPLEHO. Ta di spera ku gobièrnu, eksperto i formadónan di opinion ta konsiente ku e ‘problema di karni’ ta simplemente un manifestashon di un problema mas grandi ku tin ke ber ku falta di regulashon, no-eksistensia di (sufisiente) standàrnan tékniko, sanitario, fito-sanitario, asuntu di importashon paralelo, dòbel OB ku a mata distribudornan, nos merkado chikí i solushon pa desperdisio di kuminda. Esaki ta esnan mas importante i mi no ta deskartá ku tin mas. E pió kos ku por hasi ta kere ku tanten nos tira tur produkto ku a pasa fecha, afó sin atendé ku e problemanan menshoná, ku tur kos ta ‘koek en ei’. Mientras tantu nos ta importá outo di Hapon ku a keda eksponé na radiashon nuklear haltu despues di e desaster na Fukushima, outo di Merka ku ta téknikamente “afgekeurd”, aparatonan eléktriko ku no ta kuadra ku nos “cycle”, matanan dañino pa nos sistema ekológiko, aparatonan ku no ta kumpli ku standàrnan pa ku emishon di sierto gas, produktonan empaketá ku etikèt den idioma ku no ta pèrmitibel. Nos por sigi. Pero mester ta kla ku si tin un kos ku nos no ta hasi, ta protehá nos hende, flora i founa di produktonan dañino. Loke nos mester no ta ‘road show’ ku kámara, ounke kòntròlnan mester sigi. Prinsipal ta ku nos ta wak e problema den tur su faseta ku e meta – sin stroba inneserariamente ekonomia i komersio – pa sòru ku nos hendenan, flora i founa no ta kore peliger ku por keda evitá dor di regla, regulashon i kòntròl. E tarea aki no ta imposibel. Paisnan mas chikí ku nos den Karibe ta muchu mas leu ku nos. Ta fásil pa papia solamente di karni. Ta mas difísil atendé ku tur faseta di e problema. Den polítika nos gusta skor, hunga popular miéntras hopi di e problemanan ku nos ta enfrentá por a keda resolvé ku un aserkamentu total dia nan a presentá. Laga nos no sigi ripití e fayonan di semper. Author alexdavidrosariaPosted on May 23, 2017 Leave a comment on KARNI KU A PASA FECHA? E PROBLEMA MAS GRANDI I KOMPLEHO. On Friday, 12 May 2017, a large cyber-attack referred to as WannaCry infected over 230,000 computers in 150 countries around the world. The attack has been described by experts as unprecedented in scale. A preliminary tally shows that WannaCry has affected among others Telefónica in Spain, the British National Health Service, Russia’s Ministry of the Interior, FedEX and France’s Renault auto industry. It is expected that by Monday morning many more companies and institutions will notice that they have been attacked as the work computers are turned on. We have a small window in which to develop strong and integrated cybersecurity networks before attackers begin infiltrating. Government has to form a Taskforce to respond to attacks and provide a framework for cybersecurity. Regarding the legal environment, Government and Parliament have to review our criminal code to more effectively fight this type of crime. Existing legislation needs to be reviewed and new laws need to be drafted. We need to create more awareness regarding the consequences of cyber-attacks for our daily lives (ATMs that could be rendered inactive, air trafic control that could be disrupted, the Tax Department, the hospital, Aqualectra that could be compromised). The need for technical infrastructure and capacity building to prevent these attacks is vital as is the awareness that we by ourselves cannot adequately deal with these challenges. We need to engage in regional and international coordination. I strongly suggest this point to be included in the next IPKO (Meeting of the Parliaments of the countries of the Kingdom of The Netherlands). Time is not on our side. E problema di debe ta un prekupashon grandi pa hopi hende ku ta fia plaka. Esaki ta e kaso pasombra tin un kantidat grandi di hende den e merkado di fianansa, legal i ilegal, ku ta fia plaka ku interesnan ekshorbitantemente haltu. For di 2013 mi a bati alarma den un karta pa Banko Sentral den kua e a pidi atenshon i regla pa loke ta trata mas trasparensha di e kondishonnan di fiansa di plaka, regla pa propaganda pa fia plaka i spesialmente e haltura di interes, ku den kaso ekstremo ta yega te 3500% manera un estudio di Banko Sentral mes a konstatá na 2015. E interesnan haltu aki ta kondusí na situashonnan sosial desastroso pa hopi hende i famia. Atrobe mi a keda aserká pa hendenan ku ta sklama pa un solushon. Hendenan ku ta den un sírkulo visioso di debe ku nan no por sali afó kondusiendo na kiebro di famia, bendementu di nan poseshonnan na findishi i hasta a pusha hende den prostitushon. Den su karta pa Banko Sentral (aki bou) mi ta pidi pa urgentemente establesé pa lei, manera ta e kaso den hopi pais, inkluso Boneiru, un interes máksimo ku por kobra pa un fiansa. De shuldenproblematiek is mede door het groot aantal kredietverstrekkers die actief zijn in de sector een monster geworden voor duizenden mensen en gezinnen op Curaçao. Reeds in 2013 heb ik aan de bel getrokken en pleit wederom voor meer regels met betrekking tot transparantie van leningen, reclamespotjes voor leningen en kredietwaardigheid van mensen die een lening aanvragen en vooral de ‘loan sharks’ die krediet verstrekken tegen woekerrente, soms zelfs 3,500%, aan mensen die niet kunnen terugbetalen. Deze schuldenproblematiek leidt tot sociale ellende op ons eiland. Ik ben weer benaderd door mensen die hun schulden niet kunnen terugbetalen, die hierdoor relationele problemen ondervinden of die bijvoorbeeld uit hun huis moeten als gevolg van schulden of zelfs in de prostitutie terechtkomen. In mijn brief aan de Centrale Bank (hieronder) stel ik ook dat er dringend een wettelijke maximale rente voor leningen moet worden bepaald. With reference to my letter of April 3, 2013 regarding my concern about irresponsible consumer lending and your response on April 25, 2013, I wish to inform you as follows. In 2015 the Central Bank conducted an interesting study on small consumer lending and concluded that there is a dire need of strengthening policies that protect the interest of consumers of financial products and services. Your study also brought home the undesirable financial and social consequences of ‘loan sharks’ and their exorbitant interest rates of up to thousands of percent. As I did I in 2015, I am urging you to use all the instruments at your disposal to protect consumers of financial products and services, especially by setting a maximum legal interest rate chargeable on a loan. Postponing concrete action will contribute to even more financial and social catastrophe trapping too many people in a nightmare circle of debt they cannot escape. E último añanan a keda demostrá kon agradesido nos mester ta ku nos poder hudisial aki na Kòrsou. E no ta perfekto, pero por bisa – i pa ami ku sierto bergwensa – ku e ta é poder di nos trias politica ku mihó ta funshoná na nos bienestar general. Ku e kasonan den (i pendiente pa bai ) Korte, nos ta konkluí ku tantu e podernan legislativo (Parlamento), pero prinsipalmente e poder ehekutivo (Gobièrnu) a faya. 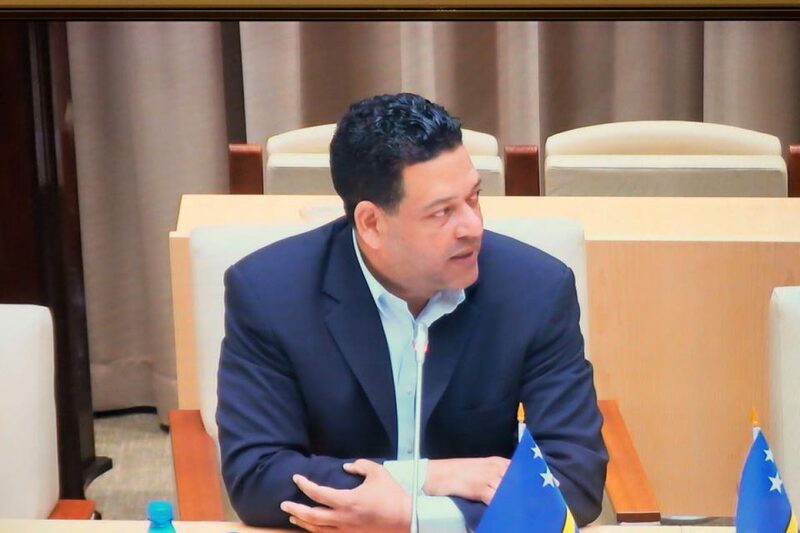 P’esei no por ta un sorpresa ku tin gruponan ligá ku mafia ku ya kaba ta bon penetrá i representá den Gobièrnu i Parlamento, ta hasi tur lokual ta posibel pa debilitá, susha i asta eliminá e sistema di Korte ku nos tin aktualmente. Nos por a tuma nota den e veredikto di Korte den Promé Instansia den e kaso di Babel, ku un casique di mafia na Italia ta lanta un partido polítiko aki na Kòrsou i pone su pòpchinan den Staten, Gobièrnu i instanshanan (semi) gubernamental pa asina sirbi e interesnan aya na Italia. E gruponan ligá ku mafia aki, huntu ku sierto partidonan polítiko ku ta sirbi interes di mafia te ainda, danki Dios, no a haña e manera pa tòrnu na nos poder hudisial. I komo pais, nos mester hasi tur lokual ta posibel pa esaki no sosdé. Lagami remarká ku un pais nunka ta bai dilanti si solamente un (1) di e tres (3) patanan di su demokrasia ta funshoná. Pero, pa awor, ta nos poder hudisial ta skapa nos te ainda ku nos no a kai den e abismo di diktatura. Nos mester ta vigilante sinembargo pa e podernan ku ta skonde tras di independensia, pa asina kamuflá nan intenshonnan real. Esakinan ta entre otro kibra nos sistema hudisial meskos ku ta hasiendo ku Gobièrnu i Parlamentu. E gruponan aki lo no ke nada otro ku someté nos poder hudisial na mafia pa asina ei reina impunidat riba nos isla pa krimen, labamentu di plaka, froude di belasting i finansiamentu di terorismo. No ta un koinsidensia ku ta e mesun gruponan aki ta(bata) kontra di mas lei pa protehá nos sistema finansiero i medidadanan internashonal di sanshon. Mi ta kere ku den e situashon aktual na promé lugá nos mester kuida nos poder hudisial. Mester renfors’é ku mas presupuesto, hende i ekipo. Den e kuadro aki nos mester di (mas) sosten i koperashon den Reino. Na di dos lugá nos mester ban traha duru pa krea konsientisashon den pueblo ku no ta kumbiní sigui sostené mafia. Pakiko? Pasombra na di promé lugá e pòpchinan ku mi a menshoná anteriormente no ta traha pa bo, nan ta traha pa mafia. Pues ora sierto partido parti stof, serbes ku kuminda, zundra Makamba i grita independensia, realisá ku esaki ta pa garantisá ku mafia i korupshon por sigui reina. I realisá ku no ta eksistí ningun pais ku a prosperá via korupshon. Realisá ku ningun pais a resolvé su problema di pobresa via mafia. Nos por kambia e rumbo aki ku nos voto 28 di aprel awor. Mientras tantu, ami ta gradesido i orguyoso di e trabou di nos Korte na fabor di nos demokrasia. Dit jaar herdenken wij dat Curaçao 70 jaar geleden voor het eerst een eigen vertegenwoordiger in Den Haag, de voorloper van de huidige positie van Gevolmachtigde minister, kreeg. De Staten van Curaçao hebben na de Tweede Wereldoorlog herhaaldelijk het verlangen geuit voor een eigen vertegenwoordiging in Den Haag om nauwere banden tussen Curaçao en Nederland aan te halen. Het belangrijkste struikelblok om dit te realiseren was het feit dat de contact tussen het bestuur in Nederland en Curaçao tot op dat moment altijd plaatsvond via de Gouverneur van Curaçao. Vele vragen rezen dus; van diepe staatsrechtelijke kwesties tot de juiste titulatuur van de nieuwe functionaris: Gezant? Afgevaardigde? Of Excellentie? Na uitvoerige bespreking tussen december 1946 en maart 1947 over de positie van de vertegenwoordiger, besloot Gouverneur Kasteel mr. dr. Moises Frumencio da Costa Gomez, Statenlid van de Curaçaosche Roomsch Katholieke Partij te benoemen om Curaçao in Nederland te vertegenwoordigen. Volgens de notulen van de vergadering van de Staten op 24 januari 1947, werd besloten dat van de drie kandidaten (da Costa Gomez, Kwartsz en Statius Muller), da Costa Gomez ” [..] den besten persoon dien wij ons kunnen voorstellen om ons te vertegenwoordigen”. Volgens het ANP arriveerde dr. M. F. Da Costa Gomez met zijn gezin op vrijdag 18 april 1947 met de Noordam. De heer da Costa Gomez verklaarde tegenover de Nederlandse pers dat men in Curaçao zeer ongeduldig was ten aanzien van de aan te brengen staatkundige hervormingen. Hij uitte de hoop als vertegenwoordiger van Curaçao zijn bijdrage te leveren. Hiermee was tevens het giswerk over zijn titulatuur verdwenen. Zowel op de zes eilanden als in Nederland werd hij als zodanig genoemd, de Vertegenwoordiger van Curaçao. De duidelijkheid omtrent zijn titulatuur verschafte echter geen helderheid over zijn positie, staatsrechtelijk gezien. Dr. M. F. Da Costa Gomez neemt zijn ontslag als zodanig aangezien hij volgens de Surinaamse krant de Waarheid dd. 1 juni 1948 van oordeel is dat de nieuwe wet op de staatsregeling van Curaçao niet duidelijk inhoudt, dat zijn post als vertegenwoordiger op de bestaande voet kan worden gehandhaafd. Dr. da Costa Gomez heeft in twee telegrammen zijn ontslag als zodanig toegelicht. In het eerste telegram aan de Gouverneur wees hij erop, dat hij deze functie niet meer nodig achtte in de nieuwe structuur. In het tweede telegram aan de Staten bracht hij zijn dank uit voor het in hem gesteld vertrouwen, maar weigerde toch „beleefd” deze kandidatuur wegens gemis aan medewerking in het belang van de constructieve opbouw van Curaçao, welke naar zijn mening was vertraagd wegens gebrek aan tijdige voorlichting door toedoen van de Curaçaose autoriteiten. Achter deze diplomatieke taal schuilde echter da Costa Gomez’s diepe zorg dat de Democratische Partij van Curaçao de verwezenlijking van de autonomie aan het dwarsbomen en vertragen was. Eerder in eind november 1947 ging da Costa Gomez reeds hals over kop naar Willemstad om door het aanwenden van zijn persoonlijke invloed de moeilijkheden en oppositie tegen de Ronde-tafel conferentie te overwinnen. Hij vond dat de verwezenlijking van zijn levenswerk, de autonomie, beter gediend zou zijn indien hij in Willemstad was. Da Costa Gomez vertrekt op 17 juni 1948 uit Nederland op weg naar Curaçao. Eenmaal op Curaçao licht hij zijn beslissing als volgt toe tegenover Het Algemeen Dagblad dd. 21 juni 1948: “Om vruchtbaarder werk in Curaçao te kunnen verrichten, heb ik gemeend mijn mandaat ter beschikking te moeten stellen. De ervaring immers heeft geleerd, dat schriftelijke gedachtenwisseling inzake fijne nuances der wetgeving doorgaans tot misverstand aanleiding geven. Daar ik van mening ben, dat rustige besprekingen, in het belang van Curaçao geacht moeten worden, heb ik gemeend ontslag te moeten nemen, daar mijn betrekking daarvoor geen belemmering mag zijn”. De heer Michael “Maike” Gorsira, voorheen hoofdinspecteur van politie wordt later benoemd tot vertegenwoordiger van Curaçao in Nederland in de plaats van mr. dr. da Costa Gomez. Hij vertrok op 3 december 1948 naar Nederland om in zijn nieuwe functie werkzaam te zijn. Reeds in 1949 moet Gorsira plaats maken voor een nieuwe vertegenwoordiger, de heer Matthias Bartels Daal. Gorsira werd in de eerste helft van 1949 kandidaat gesteld door de oppositie en Bartels Daal door de coalitie. Nadat de stemmen tot tweemaal toe gestaakt hadden, besliste het lot. De heer Bartels Daal was hoofd van het bevolkingsbureau op Curaçao.